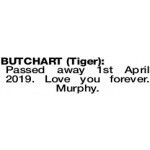 Family and friends are invited to a gathering for Tiger on FRIDAY (5.4.2019) at 1pm at 2/26 Greenwich Parade, Neerabup, WA. Passed away on 1st April 2019. Dearly loved by mother. I will love and miss you forever. 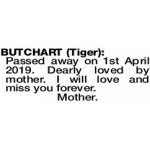 Passed away 1st April 2019. Love you forever. Murphy.